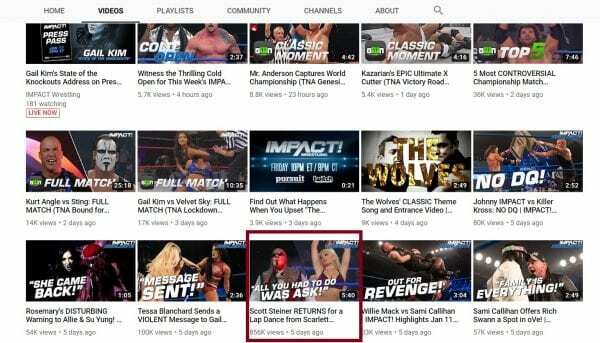 Scott Steiner made a return to Impact Wrestling and he got more than he probably expected. When all was said and done, he got a lap dance from Scarlett Bordeaux and the audience seemed to love it. The online response has been pretty significant as well. WWE has been trying riskier programming recently as well. They featured Alexa Bliss’ bare back in a segment on Monday and that video promptly went viral. The next night featured a hotel room brawl that eclipsed all over videos WWE uploaded that night too. It seems that people are buying whatever Scarlett Bordeaux was selling in her lap dance segment on Impact Wrestling. As you can see in the photographic evidence below they did big numbers with that singular video. The response of just under 900,000 might seem small when compared to the millions of hits and climbing that WWE is garnering from their scandalous videos, but it is still pretty notable coming from Impact Wrestling.